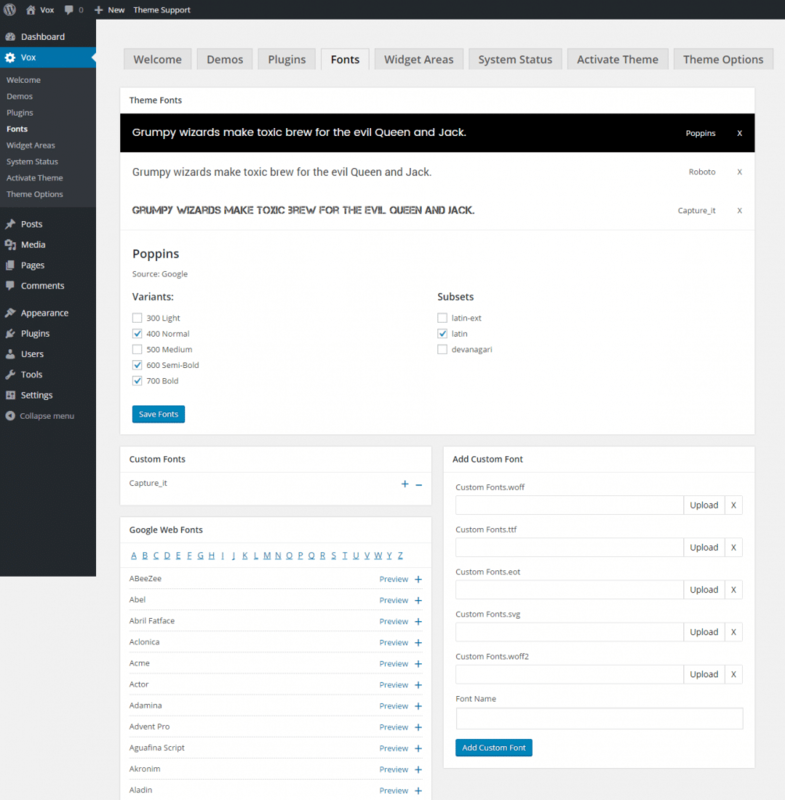 To use Talemy theme, a working installation of WordPress version 4.6 or greater is required. We strongly recommend all our theme users to use the latest version of WordPress, and properly config your server settings before working on creating your website. How to check your System Information? Once the theme is installed, you can check your system information from Talemy > Status page. Note: If you don’t feel comfortable changing these settings on your own, you can always contact your host and ask them to adjust them for you. There are two ways you can install the theme. You can choose to install it via WordPress or via FTP. Before you can install the theme, you need download the necessary theme files from your account. Click Install Themes and click the Upload button. Activate the newly installed theme by going to Appearance > Themes and clicking the Activate button. Once you activate the theme, you will see a notification message to install the required & recommended plugins. In the notification message, click the ‘Go Install Plugin’ button to go to the Plugins tab where you can install and activate the required & recommended plugins. Click on Install button on each plugin to start installing them. After you’ve installed them, Activate them. Connect to your hosting space via an FTP software. Unzip the themename.zip file and ONLY use the extracted theme folder. Upload the extracted theme folder into wp-content > themes folder. 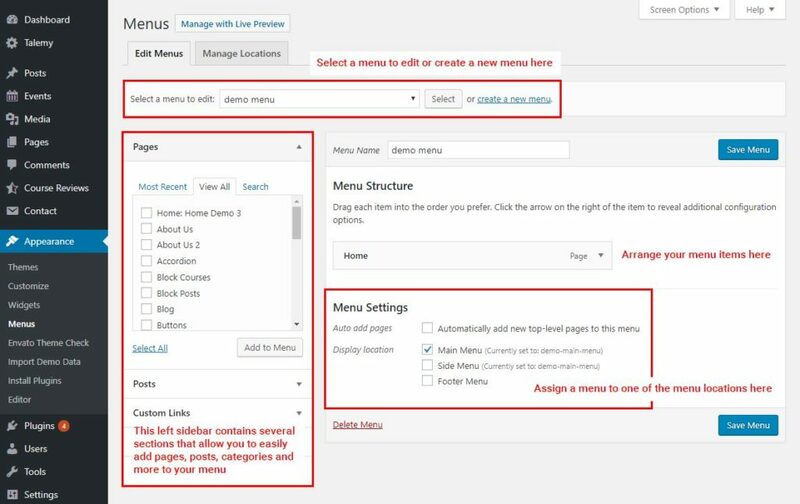 Log in to WordPress admin and activate the newly installed theme by going to Appearance > Themes and click the Activate button. Make sure you’ve installed all the required & recommended plugins by the theme before demo installation. Once you’ve done that, go to Talemy > Demos section, click the Install button to import your selected demo. Wait until the installation progress complete, this could take a minute or more. That’s it. To be retina friendly, 2 versions of logo is needed. First the normal size and the second exactly double the height and width of the normal one. Mobile/Sticky Logo – an alternative logo used on mobile screen or when the navbar is in sticky state. If mobile/sticky logo is not set, main logo will be used instead. Talemy currently offer 8 header styles, follow the steps below to change your header style. Navigate to Appearance > Customize > Header > Top Bar to access the top bar options. Top bar consist of two widget sections: Top Bar Left and Top Bar Right. You may add widgets to top bar sections from Appearance > Widgets page. Navigate to Appearance > Customize > Header > Nav Bar to access the nav bar options. 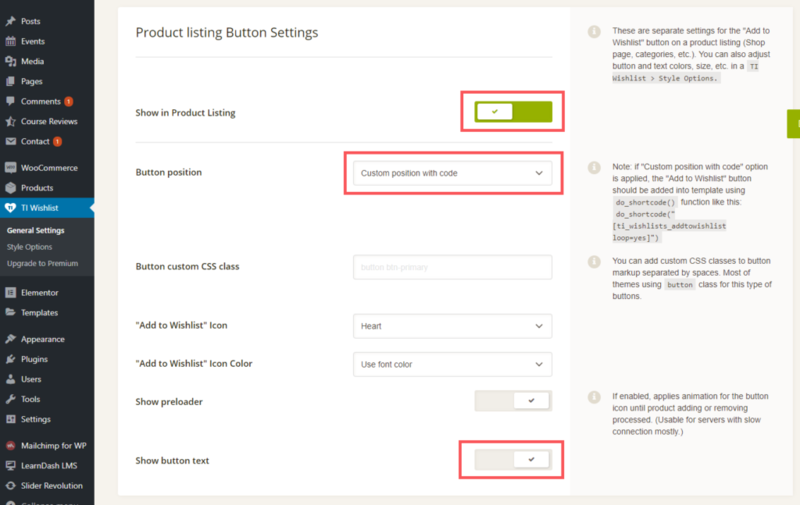 Navigate to Appearance > Customize > Footer to access the footer options such as “Footer Copyright Text”. Navigate to Appearance > Widgets page to add widgets to footer widget areas. To setup your menu, go to Appearance > Menus page. Go to Appearance > Menus page. To add a custom menu item, enter a custom name and link into the Links. After setting up your menu, scroll down to the bottom of the page to assign the menu to one of the 2 locations in the Theme Locations box. Add your menu items to the menu and arrange them in 3 levels. See the screenshot below. Click on Menu Options button to access menu item settings. On the first level, set Menu Type option to Mega Menu. 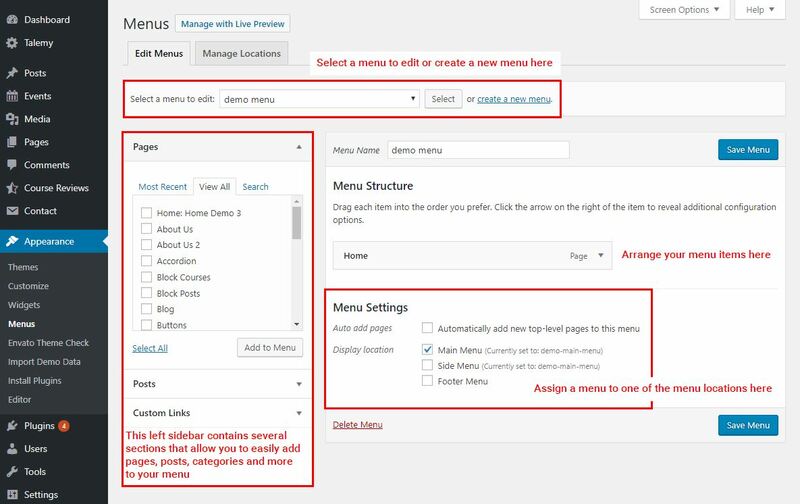 Set Mega Menu Width in columns, each columns equals 220px in width. For full width menu simply select 8 columns. On the second level, set Column Width relative to the menu width. e.g. 1/2 is the same as 50% of menu width. Second level menu items also act as the column titles, hide the title by checking the Hide Column Title option. Third level is where you put most of your mega menu items. Alternatively you could also assign a Widget Area to a menu item, so it can display widget content as drop down. Icon Image – Use an image icon instead of an icon font, icon font option will be ignored if icon image is set. Menu Type – Select “Mega Menu” option to use Mega Menu as submenu. Menu Width – Menu width are measured in columns, each columns equals 220px in width. For full width menu simply select 8 columns. Column Width – Set a width relative to the total menu width. e.g. 1/4 is the same as 25% of menu width. Widget Area – Display widget content from selected sidebar. Hide Column Title – Hide menu item completely including the icon. Start a New Row – Display current and proceeding columns from a new row. Talemy allows you to create unlimited number of sidebars, and these widget sidebars can be assign to varies WordPress templates and individual posts/pages. Navigate to Appearance > Widgets page and locate the add new sidebar box on top of sidebars column on the right. Add a unique sidebar name and description (optional), then click the Add New Sidebar button. That’s it! Expand/Click on the sidebar you’d like to remove. Click on the Trash icon on the bottom right of the sidebar box, and click okay to confirm you want to delete the sidebar. That’s it! 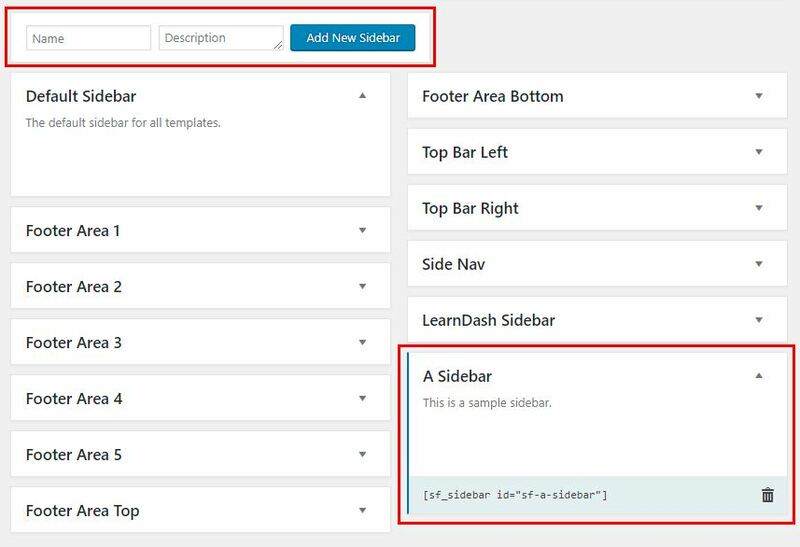 Use the sidebar shortcode displayed on the bottom of the sidebar box in a post/page or wherever applicable. Talemy has an ease-to-use font system integrated seamlessly with the theme. By default the theme will load fonts from the Theme font list and Customize > typography settings, To optimize your website loading speed, it’s recommended to only include fonts, variants, that are needed for the website. It’s easy to use custom fonts with Talemy, you could literally install any font to your theme through theme’s custom font system. To provide the best range of browser support, its best to include as many font formats as possible. Please make sure that you have the appropriate license to use the font. Almost all free fonts can be used on a website and many premium fonts are available with a license that covers web usage. Step 2. Go to Talemy > Fonts, find Add Custom Font section. Click Upload buttons to select your font files from your computer and give your font a unique name. 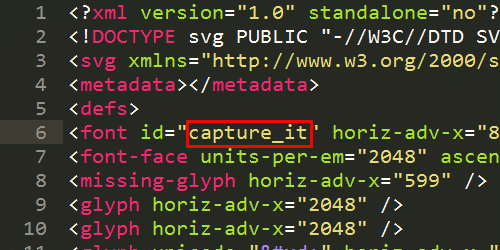 If your font files include svg format, please make sure your font name is the same as the font id in svg file. You could check the font id by opening the svg file in a text editor. Step 3. 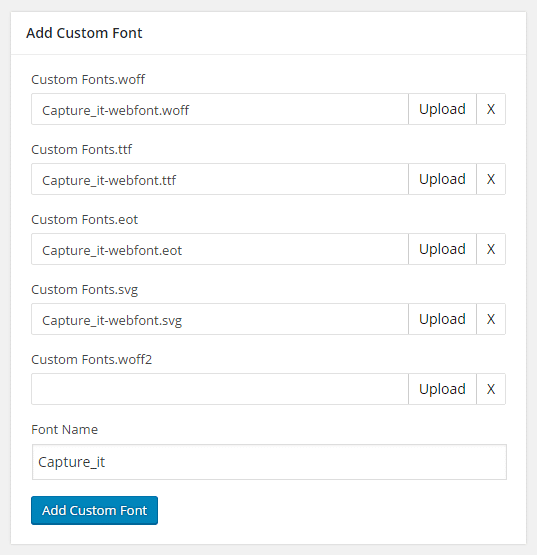 Click Add Custom Font, and wait for your font files to be uploaded. Your custom font will appear on the Custom Fonts list when its added successfully. 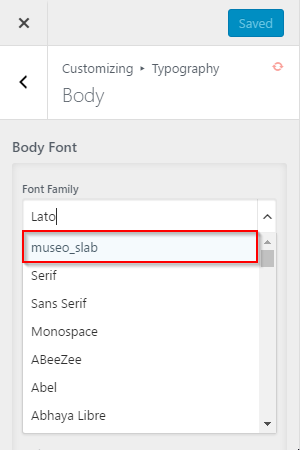 Simply clicking the + button to add your custom font to the theme font list then click Save Fonts. Your Custom Font will be ready to use on Customize > Typography settings when it’s on theme’s default font list. Talemy uses LearnDash to create and manage online courses. LearnDash Custom Meta – Add custom meta such as duration, course level, course languages etc. LearnDash Course Reviews (Premium) – Enable a ratings and reviews system for all your courses. To learn how to use LearnDash and get support, please go to LearnDash support site. How to add wishlist button? 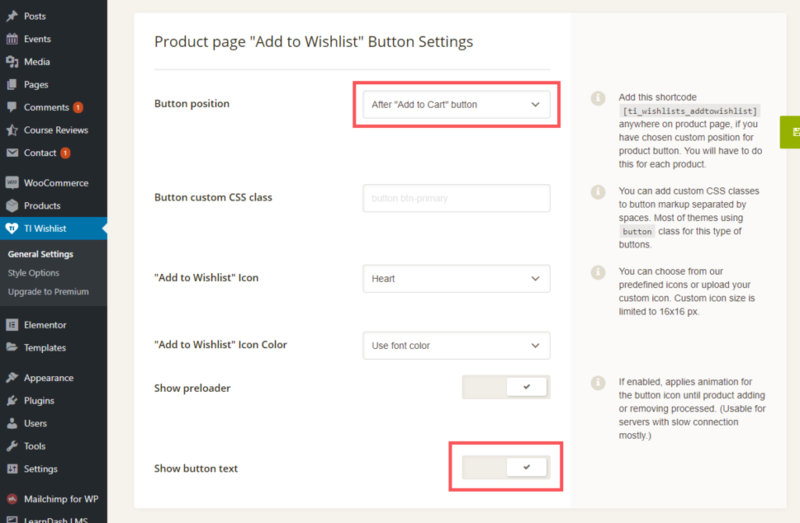 To add wishlist button to woocommerce pages, please install & activate WooCommerce Wishlist Plugin. 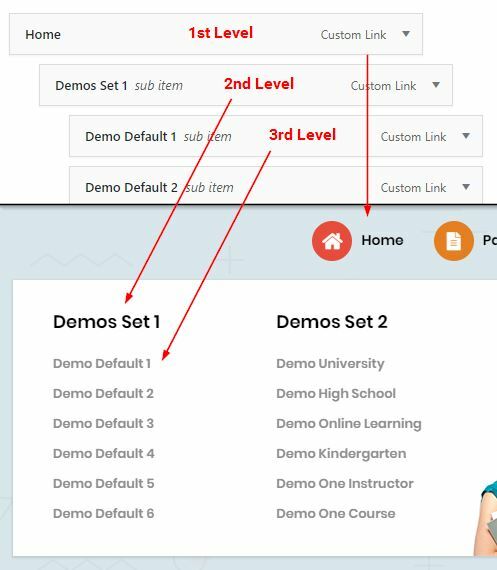 Here are the settings used in our theme demo. Install WordPress in your language or install your language from WordPress Admin. Create contents in your language. Since WordPress 4.1 you can install new languages (and change your website language) from the WordPress dashboard. It’s very easy. Skip this if you already run a copy of WordPress in your language. Under Site Language, select the language you’d like to install and click Save Changes button. 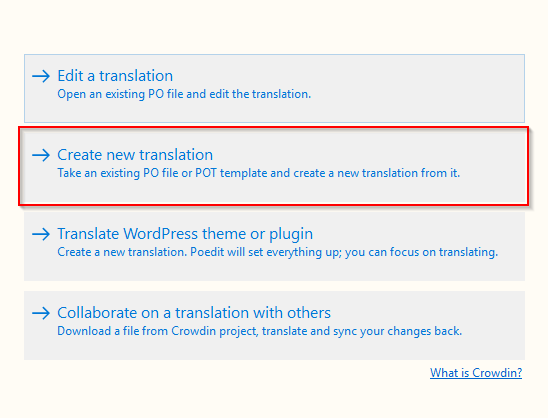 Download and install POEdit translation editor. Open POEdit and click Create new translation. Select the talemy.pot file from theme languages folder ( talemy/languages/ ) and click Open. Translate all the strings in the list and save the .po file without altering the file name. Upload these files (.po and .mo) to talemy/languages/ folder on your server. That’s it! For multilingual sites, we recommend to use plugins like WPML or Polylang. These plugins are well-known solutions for multilingual websites and it’s popular among WordPress users. Talemy theme is compatible with these plugins.